17th. This is of course spinning off of his appearance in the Daredevil series. Which brings us to this point. 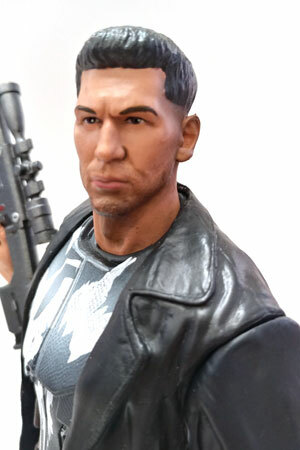 Earlier in the year, Diamond Select solicited pre-orders for statues in their Gallery series for the Netflix versions of Punisher and Daredevil. 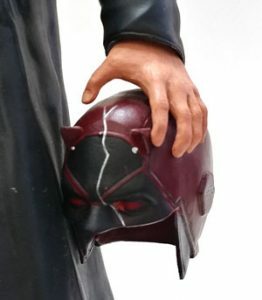 Now at the time, I don’t believe we’d seen the Marvel Legends figures and I’d heard good things on the Gallery statues from my fellow cohost Scott from the Action Figure Blues Podcast. So, I preordered both of them. Fast forward some months, and a Marvel Legends set of Netflix figures, and the first two came in. Now, I say first two because I didn’t realize a few things. One there was a Luke Cage out there previously. There were preorders for Jessica Jones and Elektra. (Elektra is coming in November and Jessica in February.) Honestly, if I had saw the Marvel Legends figures first, I might have skipped these. Or maybe just got the Punihser one. Frank Castle come in a big square 3 window sided box. Inside is a reverse clam shell to hold him securely. Now, something I’m not quite used to is this all one piece. No assembly required. No swap outs or changeable weapons. Nada. 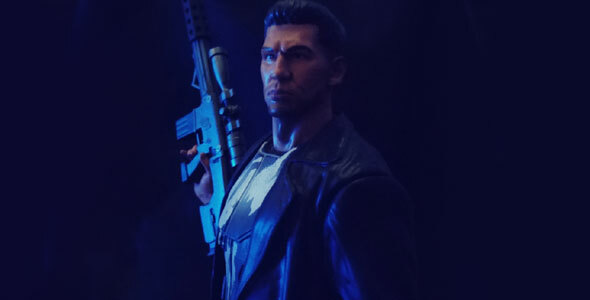 So from the ground up this is Frank standing on a bit of rooftop looking out with scoped riffle in one hand and Daredevil’s broken helmet in the other. 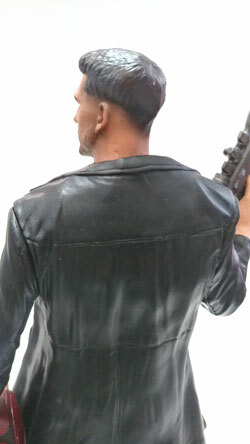 Like the Marvel Legends figure, he’s wearing a trench coat. This one is also made of some rubber like material. Now the downside to that trench coat is that it covers quite a bit of his chest skull. Enough that if you didn’t know the character, you would be able to tell what that stylized pattern is. There is some panels on the body armor that make up part of the eye socket on the right side of his chest. the left doesn’t have the white going down that far so it doesn’t create the symmetry you need to recognize the eyes. To me, the white looks a little more like a asymmetrical screen printed pattern on the chest than the famous skull logo he has painted on himself. The skull is there, but you kind of have to have an idea of what you’re looking for first. The white from teeth has a dripped spot down on to a belt. I actually didn’t pick up on that until I took the pictures. There is some nice bronzey color on some ammo carriers on his armor piece, they kind of pinch the area in for the teeth so I do like that part. Just like the body, I have kind of mixed feelings on the head. I think the face is good likeness, it’s not perfect but it’s good. It seems a little soft if anything. The paint here is pretty good. The eyes and eyebrows are well applied. The beard doesn’t look like paint just slapped on. Then there’s the hair. The detail here in both sculpt and paint is very soft. He looks very much like the slick backed greasy haired dude with a pompadour he did in early comic appearances. The paint doesn’t help here. I’ll be the first to admit, I’m not crazy about his haircut in general. But the paint really has solid square lines for the black where he has actual hair. They they have done very apparent and very airbrushed looking black fade to give something to the shaved area of his head. 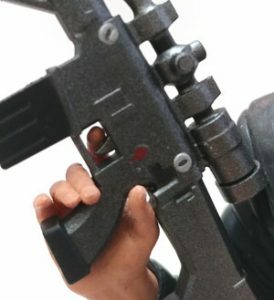 The gun is his right hand looks pretty good. Has a nice dark silver finish for the most part with some black detailing. There are two screws on the front that kind of stand out a bit. I’ve never seen anything in real life like them, but I’ll allow it. The fire selector switch is in red so it pops a bit. The scope and hand guard look great. Love the detail on the sides of both. However, there is a lack of detail on back side gun where the ejector door and cover would be. There is a very slight square there, but it is hard to see. The barrel also has one of my pet peeves, the barrel has a slight indent instead of an actual hole. A slight niggle is the fact that Frank has his finger on the trigger. Knowing he is a professional, I would think, considering the pose, he would be displaying proper trigger discipline and have his finger off the trigger. Now, here’s the strange part. I like this piece. Not as much as I hoped I would. But let’s be honest, this isn’t even in the same price ballpark as even the next statue grade up. 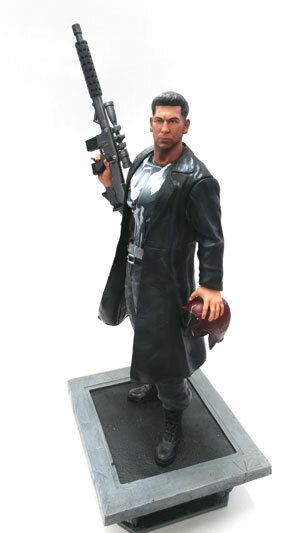 The pose, the roof base, and general attitude of the thing make it a very distinct Punisher. 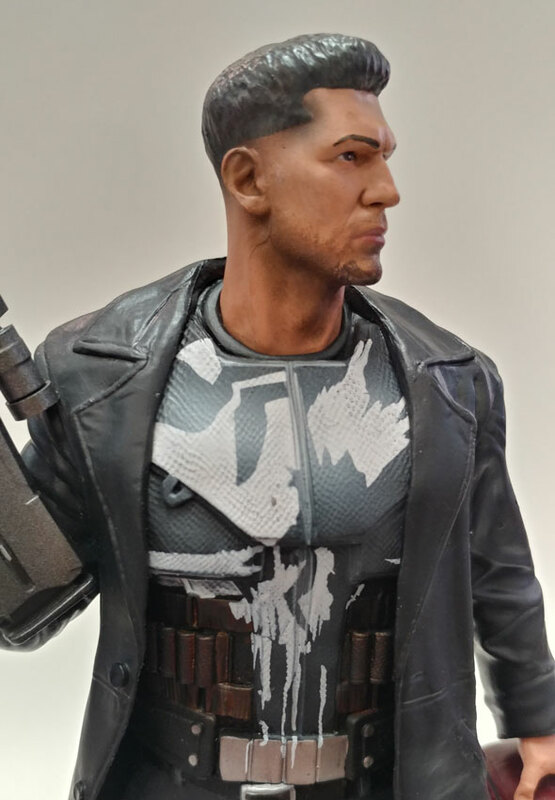 If you are a fan of the Netflix version of Frank Castle, this might be a an okay little highlight piece to add to your collection. I actually plan on putting these in my TV area of the basement. The good thing about that is the size, (about 12 inches) is that it will stand out from where my seats are more than a 4″ action figure. In general, when I’m not close up to it, I like it. Maybe the things I mentioned above won’t bother you. By my TV he will be very dramatic piece to show my Punisher fandom. If he was up close to me on my desk at work, the little stuff would but me. If you I haven’t scared you off and you want one of your own, please considering getting him from Entertainment Earth with this link. I’m pretty much in agreement with all of your points. I can deal with most, but the holding the helmet without the thumb touching is weird. 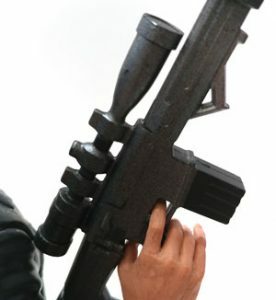 The other odd thing for me is the size of the pistol grip, it looks small compared to his hand. Maybe he just has big hands? Dunno?